​ The Alachua County Crisis Center invites residents to the “International Survivors of Suicide Loss Day” on Saturday, November 17, 2018, from 10:30 a.m. to 12:30 p.m. at the Survivors of Suicide Loss Memory Garden at Cofrin Nature Park (4810 N.W. 8th Ave, Gainesville). This event is free and open to the community, and refreshments will be provided. Those wishing to attend are asked to park at the University City Church of Christ parking lot, east of Cofrin Nature Park at 4626 N.W. Eighth Avenue. Parking is available at the park for those with a disabled parking placard. International Survivors of Suicide Loss Day is designated as a day when the friends and family of those who have died by suicide can join together for healing and support. The Survivors of Suicide Memory Garden was dedicated in 2013, with the purpose of serving those who have experienced the loss of a loved one to suicide. The garden offers a space for peaceful reflection to those who have experienced any kind of loss and is also open to the community for those who wish to find retreat amidst the beauty and comfort offered by the garden. The vigil is sponsored by the Friends of the Crisis Center, in partnership with the Alachua County Crisis Center and the Survivors of Suicide Support Group. 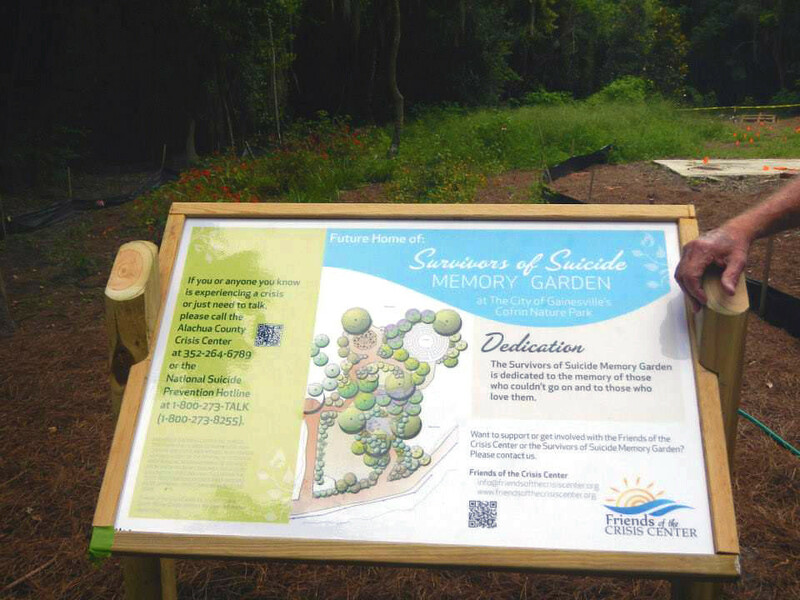 The Friends of the Crisis Center would like to extend thanks to the City of Gainesville Parks, Recreation and Cultural Affairs Department and the Alachua County Commission for their support in the development and maintenance of the Survivors of Suicide Loss Memory Garden. For more information, contact Alexandra Martinez at 352-264-6792 or amartinez@alachuacounty.us.